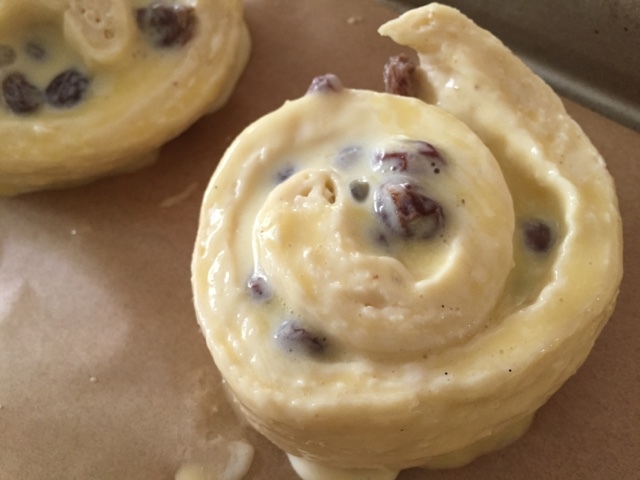 I have been a long time admirer however haven't ventured into making my own pain aux raisins. Now, having made it, I have a dual appreciation of the bakeries I've purchased these from before. Not only are there pastries involved from the dough proofing and butter incorporating perspective, the sheer amount of butter (read: there is a reason they are addictive) is enough to make this a worthwhile bakery purchase investment. That said, I loved making them as much as consuming them. Shift all the dry ingedients together. In a separate container combine the water and milk. Add to the dry mixture. Kneed until a uniform ball forms. Oil a bowl, place the dough into it and let rise for one hour. In the meantime, make the patisserie creme. There are plenty of recipes on the web, so choose your favorite. I used 2 cups of milk to 3 yolks/3tbsp sugar ratio and ended up using half the resulted creme for the pastries. Let the patisserie creme cool completely before using. Soak 1.5 cups of raisins in hot water. Roll the flattened but cold butter into your proofed dough. Fold and roll out again. The more you do this the more flaky the resulting dough will be. The key to this process is keeping the dough cold to the touch the entire time not to melt the butter. The best way to achieve this is to work fast with your dough, relying on the pressure from your rolling pin and least amount of handling with your warm hands. You want to do this at least 8-10 times. The minute the dough starts getting back to room temperature, transfer it to the fridge for 30 minutes or so. Wrap your dough in plastic wrap and refrigerate for 8-24 hours. Roll out the cold dough into a rectangle. The thickness should be around 1/4 in. spread the patisserie creme 2 inches from the long end. Sprinkle with drained and dried raisins. Roll from the long side in the direction of the rectangle uncovered with creme. Rest the resulting roll on the dough seam and transfer to freezer for 30 minutes. Remove from the freezer and cut into 1 inch rolls. Place rolls on parchment covered cookie sheets (you'll end up using two), spacing them well to allow for the rise. Let rise for 1 hour. Cover with egg wash.
Bake in a preheated over at 400F for about 15-20 minutes.